On Saturday I discussed why I might have been early in my call that we had potentially reached the ‘Return to “normal”’ phase of the UK house market. 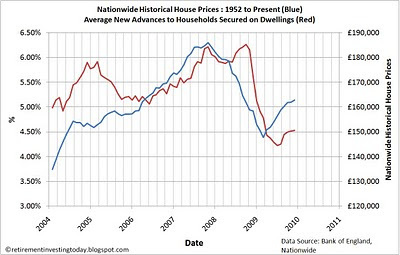 I would like to revisit this again as I continue seeing data that is potentially starting to point towards a further housing market correction. The first chart is a repeat of that shown on Saturday. I described how the new interest rates secured on dwellings are still very low at 4.5% compared to the peak of 6.3% and have likely had a big effect on the market. What is of interest however is that this 4.5% increase is 7% more than the low of June 2009 and is trending in an upwards direction with no assistance from the Bank of England. The second chart today also shows another interesting piece of data. 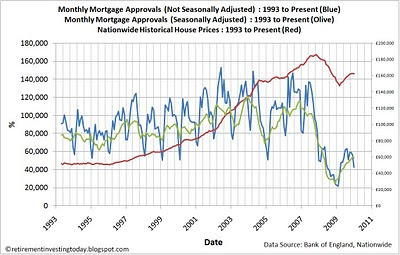 The olive line is the most interesting which shows seasonally adjusted monthly mortgage approvals decreasing for the first time in 13 months dropping from 60,045 to 59,023 in December which is a decrease of 2%. Rising mortgage interest rates will put pressure on those who have variable rates or are coming off fixed rates. It will also decrease the level of borrowing possible for a new person trying to enter the housing market. Additionally falling mortgage approvals suggests less competition in the market for each house that is for sale. Could the rules of supply and demand finally start to work in the near future?